In late October, the Defense Department announced it would deploy thousands of active-duty personnel to aid the Department of Homeland Security and U.S. Customs and Border Protection “to harden the southern border,” said Air Force Gen. Terrence J. O’Shaughnessy, the commander of U.S. Northern Command and North American Aerospace Command. The DHS support operations was initially designated Operation Faithful Patriot but now is just referred to as border support. So far over 5,200 armed active duty soldiers have joined 2,092 National Guardsmen participating in Operation Guardian Support. DOD will provide a range of assistance, including planning, engineering, transportation, logistics and medical support to the U.S. Customs and Border Protection enhancing their ability to impede or deny illegal crossings and maintain situational awareness as it contributes to CBP's overall border security mission. Light towers, barrier material, barbed and concertina wire, as well as cases of MREs. Troops will be billeted in specific locations and will fan out along the border as needed in Texas, Arizona, New Mexico and California, although the report of 14,000 active-duty members recently quoted in many news sites is not in line with planning numbers, O’Shaughnessy said. For over a week the media has been covering the large caravans of thousands of Central Americans making their way towards the U.S. southern border, although it may be weeks before any of them even get close to America. Unfortunately the flood of illegals has been going on for decades, and is nothing new for U.S. Customs and Border Patrol. According to CBP, during FY 2018, a total of 396,579 individuals were apprehended on our Southwest Border between Oct 1, 2017 and Sep 30, 2018. In FY 2017, USBP apprehended 303,916 individuals along our southern border. and they do so much more ~ read CBP daily stats here. Typically small groups of dozens or hundreds of people make the journey up through Mexico, but these caravans with thousands of Central Americans are being organized openly by several groups intensifying the immigration and border debate. For example, in this video from 30-Oct a FOX News reporter revealed an organized bus operation loading illegal immigrants from the first caravan for rides in Mexico, as a second group was entering from Guatemala. Also the attitude and violence is more pronounced with these groups. A few days after the first large group crossed into Mexico (most of them wading across the shallow Suchiate River), a second group back in Guatemala was more unruly. Guatemala's Interior Ministry said several Guatemalan police officers were injured when the mostly male group broke through border barriers on Guatemala's side of the bridge. Mexico authorities said migrants attacked its agents with rocks, glass bottles and fireworks when they broke through a gate on the Mexican side, but were pushed back, and some allegedly carried guns and firebombs. Mexican Interior Secretary lamented what he called a second 'violent attempt' to storm the border, accusing people of placing the elderly, pregnant women and children at the front, putting them at risk of being crushed. Now Mexico has the unprecedented situation of having 4 caravans with about 6,000 to 7,000+ migrants total stretched over 300+ miles (500 km) in southern states of Veracruz, Oaxaca and Chiapas. The first, largest group of mainly Honduran migrants entered Mexico on Oct. 19. Though the first caravan once numbered as many as 7,000, it has shrunk, but exact numbers are unknown as people scatter across highways and in small towns. Mexico’s Interior Department estimates group now is 3,000 to 4,000 and is in Oaxaca near the Gulf state of Veracruz. The second caravan of about 1,000 to 1,500 Hondurans, Salvadorans and some Guatemalans is now in Chiapas. 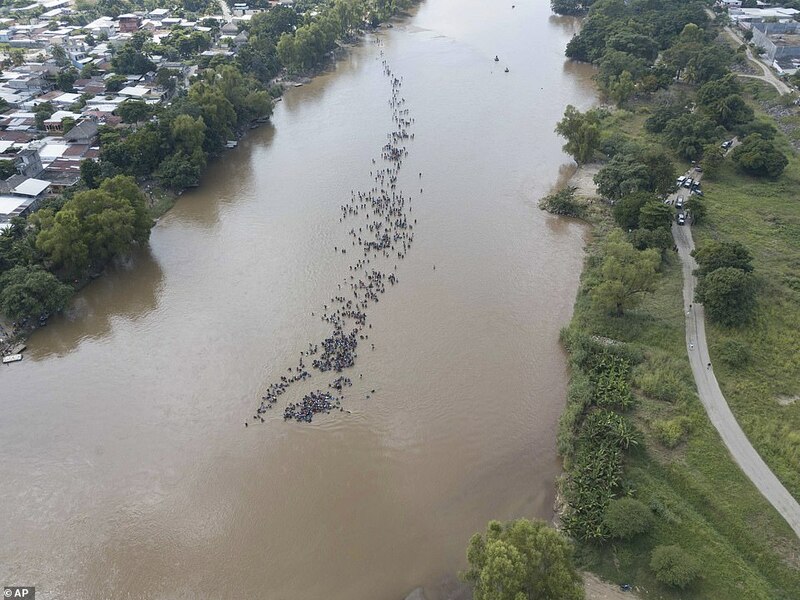 A third caravan from El Salvador waded across the Suchiate River into Mexico on Friday (11/2), bringing another 1,000 to 1,500 people heading toward Tapachula, Chiapas. Recently Mexican officials identified a fourth, smaller group of 300 Central American migrants walking further ahead of the first group, in Veracruz. The Mexican government has offered all of these people temporary work visas, asylum and social benefits, as well as transportation home. Nearly 3,000 from the first caravan applied for refuge and about a thousand have returned home, but the rest rejected Mexico’s offer of jobs and services, none have applied for asylum there, and they all want in the U.S. According to Arizona Central (who has a caravan tracker map in article), immigration observers in Central America say caravans have become popular for security reasons as migrants bet on strength in numbers. As groups wind their way through Mexico, media outlets provide coverage and organizations such as the U.N. High Commission for Refugees and state human-rights commission monitor the migrants’ progress — dissuading police from launching mass action against them, they say. Caravans also allow migrants to forgo paying "coyotes", who demand between $8,000 and $13,000 for the trip, and some cartels charge a fee to cross the U.S. border in areas with weak barriers. As these groups continue from Veracruz up along the Gulf side of Mexico towards southern Texas, they will be traipsing through cartel country ~ primarily Jalisco New Generation, Los Zetas and Gulf Cartels. The central and western borders of Texas, New Mexico and Arizona are predominately Sinaloa cartel (see above 2017 map), with El Paso area of Texas controlled by the Juarez cartel. As of early November, most estimates say these large groups are 2 to 4 weeks away from the U.S. border, but again, these illegal crossings and lax immigration policies have been going on for decades challenging U.S. homeland security officials and the country in general. This is not a political post but rather a thread to share some background on the situation and updates on DOD's border support efforts going forward. And please feel free to share your thoughts in comments below too. from DHS.gov 1-Nov-2018 - Myth vs. Fact: Caravan - Below are the facts surrounding the “caravans” en route to the U.S. Southwest border.